Introducing our brand new Traineeship Education Programme. 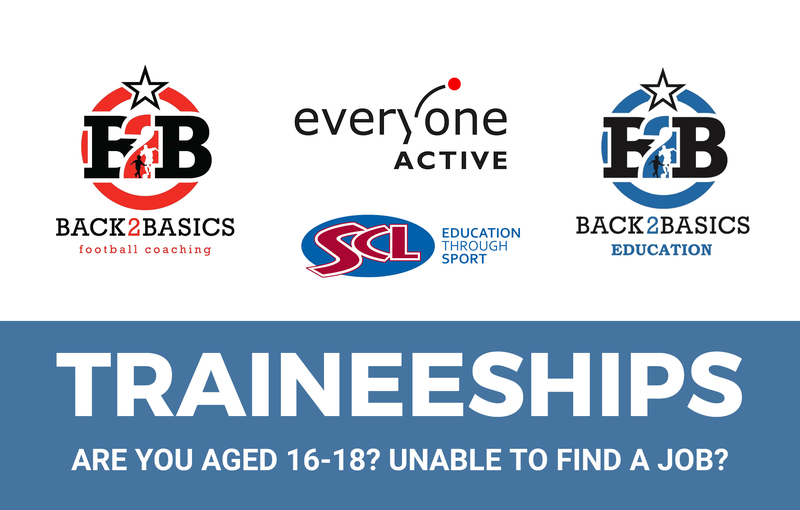 Back2basics are please to announce our NEW TRAINEESHIP PROGRAMME in Sports Coaching in Partnership with Everyone Active Sports & Leisure. We want to help 16-18 year olds get back into work and or education by delivering Traineeships over 12 WEEKS (30 hours a week) with the opportunity of a JOB INTERVIEW, APPRENTICESHIP or at least moving onto a level 2/3 College programme. This course is FREE OF CHARGE. Our Traineeship programme will provide the opportunity for you to improve both the skills and experience to help gain employment or an Apprenticeship.